Home > Emergency Supplies > Emergency Tools & Supplies > Earthquake Preparedness Supplies > QuakeHold! Museum Wax Clear 4 oz. Home > Earthquake Preparedness Supplies > QuakeHold! 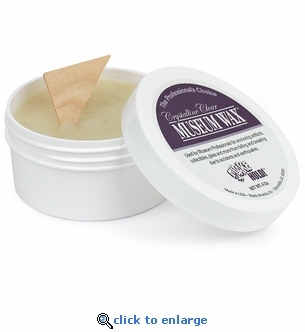 Museum Wax Clear 4 oz. QuakeHold! Museum Wax Clear 4 oz. Quakehold Museum Wax is a microcrystalline material that provides instant grip to secure collectibles and other valuable display pieces. Museum wax is intended for use on items that need to be secured permanently on a wooden surface. Used by museum conservators, this amazing product will protect items from falling during an earthquake or when accidentally bumped. Specifically designed for use on wood surfaces, such as shelves and bookcases, this adhesive will not damage the wood and can be removed with mineral spirits. Our 4 oz. jar is enough to secure up to 200 items of average size. Scoop out a little from the jar and roll it into balls, apply it to the bottom of an object, then lightly press the object on to the surface. Quakehold Museum Wax: Use for anything being secured on a more permanent basis on wooden shelves. Quakehold Museum Putty: Use for China, pottery, ceramic, or wooden items on a variety of surfaces. QuakeHold! Clear Museum Gel for Glass & Crystal - 4 oz.